Who has the momentum? Second Amendment supporters or the gun-grabbers? With the 2018 session of the Iowa General Assembly well underway, anti-gun media elites, state legislators and political insiders across Iowa are all waiting with bated breath to find out. They’ve seen media reports claiming the political winds are blowing strongly the gun-grabbers’ way. But they also remember how Second Amendment supporters shocked the political world in November 2016 and then followed that up by forcing passage of Stand-Your-Ground law last year. The first few weeks of the 2018 General Assembly will “seal the deal” in many people’s minds on who has the forces to be reckoned with this year . . .
That’s why it’s so critical you and I create and maintain a massive tidal wave of pressure on the General Assembly for Constitutional Carry. So can I count on you to please sign the Constitutional Carry petition that I have prepared for you? More on the below. 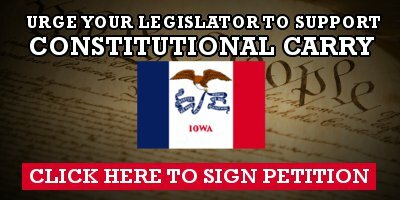 As you’ll see, this petition insist that your legislators support the Iowa Constitutional Carry Bill that Senator Rick Bertrand has filed! Of course, thanks to your support, we already have an astounding 19 Senators backing this legislation. If passed, the Iowa Constitutional Carry Bill would restore the right of every law-abiding Iowa citizen to carry a gun to protect themselves and their families — WITHOUT going through a bunch of bureaucratic rigmarole! That means no more expensive application fees, paperwork or adding your name to a government database — just to exercise your Second Amendment right to keep and bear arms. In short, if you’re legally able to own a firearm, you’re legally able to carry it. Period. The good news is, despite the hand-wringing of nanny-staters like BILLIONAIRE anti-gun activist Michael Bloomberg, none of the states with Constitutional Carry are plagued with vigilante justice or Old West style shootouts. Just the threat of running into someone who is armed is enough to convince many career criminals to think twice. That’s a big reason why statistic after statistic proves that guns in the hands of law-abiding citizens means less crime. In fact, according to a recent FBI “Crime in the United States” report, gun sales have hit record highs in recent years, while violent crime has dropped dramatically! And a study commissioned by the Obama administration — which was supposed to help generate momentum for gun control — found that firearms are used in defensive cases up to three million times per year! The good news is, with Constitutional Carry’s passage into law in Missouri last year, and gaining steam in neighboring Minnesota, Wisconsin, and South Dakota, I’m confident you and I can get the job done — if I can count on your support today. But if you and I miss this opportunity to pass Constitutional Carry, it could be years until we’re in this situation again. So help us crank up the heat, by signing your Constitutional Carry petition right away! The truth is — sensing that the political winds will be blowing strongly their way throughout 2018 — the gun-grabbers are banking on a takeover of our General Assembly. And you and I know what happens when gun-grabbers seize control. For years, Senate Judiciary Chairman Steve Sodders (D) and Senate President Mike Gronstal (D) used their power to bottle up pro-gun reforms like Stand-Your-Ground and Constitutional Carry without so much as a public, roll-call vote. And Iowa’s Second Amendment supporters got NOTHING — except for attacks on our existing freedoms whenever some madman or bloodthirsty killer decided to go on a rampage somewhere in the country. The good news is, just forcing a public, roll-call vote on Constitutional Carry could be the ticket to ensuring Iowa doesn’t get swept up in an anti-gun tsunami in 2018. Politicians who choose to vote against us — the “wolves in sheep’s clothing” in Des Moines — will find there’s a major political price to be paid at the ballot box. That’s why just forcing a vote puts you and me in a win/win situation. But in order to do that, we need grassroots gun owners all over the state to maintain constant pressure on their legislators. So please do your part, and sign your petition right away! >>> Hard-hitting Internet, radio and newspaper ads calling out those who oppose Constitutional Carry. Trust me. This will get the politicians in Des Moines to listen this year. But I’m counting you to make it happen. So in addition to signing your petitions, won’t you please agree to your most generous contribution of $100 to help Iowa Gun Owners TODAY? Every dollar you can give will go to helping Iowa Gun Owners build support for Constitutional Carry — so I hope you’ll be generous. Of course, if $100 is just too much, please agree to $50 or at least $25. With Constitutional Carry on the march all over the country, it’s up to you and me to wipe these infringements on our Second Amendment rights off the books here in Iowa. If we don’t, it could be years until we have this opportunity again. If you agree, please sign your Constitutional Carry petition right away, and please consider your most generous contribution of $100, $50 or at least $25 TODAY! P.S. With the 2018 session of the Iowa General Assembly well underway, we have to prove we have the momentum on Constitutional Carry — and FAST! If we miss this opportunity to pass Constitutional Carry, it could be years until we have another opportunity like this. 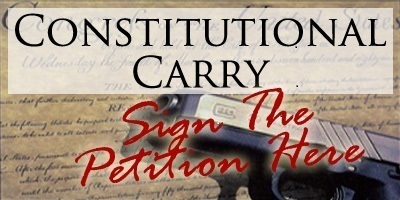 So please sign the Constitutional Carry petition that we’ve prepared for you right away! And when you are done, please make sure we have the resources we need to mobilize an army of grassroots gun owners, with your generous donation!